The blog is finally all caught up. Now you'll get our boring old "this is what we did today" updates. The summer adventures are all recorded and ready to be put into my sixth blurb book. Can you believe I just received number five in the mail this week? Quite a chronicle, but I have to say it's fun to flip through them and see all the posts of the past. My camera is not working. Long story, sad story. Ultimately it has to do with a very sweet 4 year old girl who thought she was being helpful by trying to bring my camera to the car and dropped the whole thing hard. As in cement hard. As in it wasn't in its camera bag hard. Aaron is taking it to the camera doctors tomorrow, but I just know that we won't know anything for a few days. They'll have to send it off to Canon to get the estimates. But I guarantee it won't be cheap. Sad sad sad. He wants me to put a price on it but I think he just secretly wants me to upgrade. But I can't do it, I love my camera. Fortunately I got to take photos Saturday of Greta at her first real tea party that hopefully she will remember. Those were the last photos I took this weekend before the "accident". We did manage to finish up two house projects, but again, can't share the final photos without the camera. But those were big check marks on my to do list. And then Saturday I came home to a lovely surprise, our friend had stopped by with a truck full of plants ready to be planted. I came home and everything was done. They spent a few hours planting things like snap peas, onions, strawberries, carrots, and a ton of other stuff I don't remember, but they even used paint mixer sticks to label everything. And I got a good 'talking to' about my garden issues. Hopefully these survive. We haven't lost the herbs although he said the basil is almost out of season so I better chop and freeze everything now. The brussel sprouts had some bug issues so I learned how to make this dish soap, water, olive oil concoction which I sprayed on everything this afternoon. It was quite educational. The blueberries look great and the lettuce is done, but we had a great run with it. Our compost is looking good too, but I think I need more worms. Mmmmmm, worms. Thank you Peter! You are my gardening idol. Saturday we also took the kids to a fun fundraiser at Landmark Theaters where they were showing Beverly Hills Chihuahua, and they had Papi there (the dog). All the ticket sales went to my boys' school and they gave out super generous goodie bags to top it off. Ok, that movie is funny. Seriously, I laughed out loud a lot and that's the only reason Aaron came with, he likes to watch me laugh at dumb kid movies. Saturday was busy no? Wait, Aaron and I also went to a cocktail party that night for Greta's preschool. Saturday was a long day, too busy for my taste, but some days are like that. No doubt that is why we slept in Sunday morning until. . . wait for it. . . . 8 oclock! Well, I slept til 9, but the kids slept til 8. Unheard of. But that tells me that my sister probably didn't put the kids to bed at their normal bedtime. Or maybe it was because she injected sugar into their veins. Just wait Romeo. My turn will come. Your Zia is going to get your mama back big time! 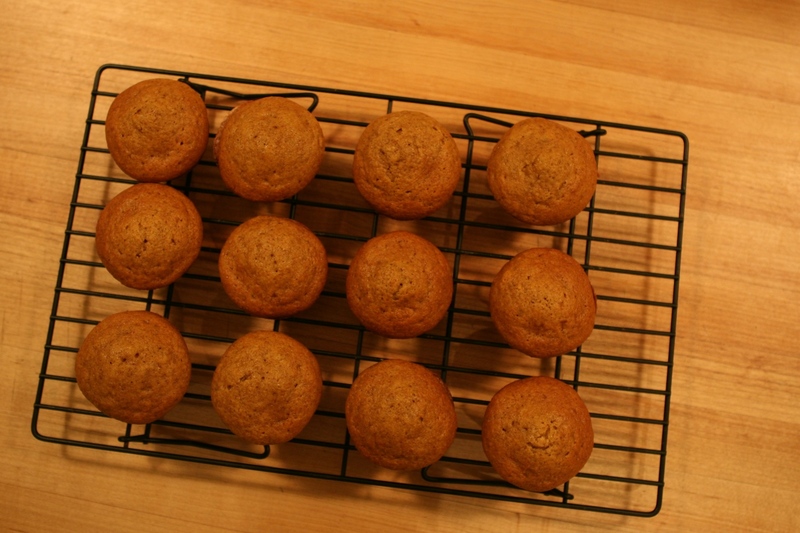 I'll leave you with a picture of these delicious pumpkin muffins Aaron made last week. They were so good. The kids had them in their snack bag for a few days for school and were quite happy every recess. Not to mention I ate two muffins, two nights in a row.